RESCUE BENGALI SPEAKING HINDU – BUDDHIST PEOPLE FROM ROHINGYA MUSLIM CAMPS IN MYANMAR. DON’T EQUATE ROHINGYA REBELLIONS AND BANGALI HINDUS IN A SAME ROW. SAVE BANGALI HINDUS IN MYANMAR. Bengali Speaking Hindus – Buddhists are not the Rohingya Muslims. Save Myanmar Hindus from the onslaught of Rohingya Muslims. The hell-bent Islam is disturbing the peace, destroying the civilization and degenerating the human ethos all along. From Myanmar to Michigan, Xinjiang to Rakhaine, Delhi to Detroit, London to Leh, Asia to America, Europe to Australia, Antarctica to Africa, the carcinogenic Jihadi scars are manifesting its unbound growth all over the human society in a frame of fatal death trap. The Arakan region of Myanmar is also severely epitomized with a Jihadi upsurge against Burmese (Myanmar) State by the Bangali (Bengali) speaking Rohingya Muslims originally hailed from the nearby Chittagong region of Bangladesh. Over the last 200 years these Rohingya ethnic groups have been trying to gain their Islamic supremacy over the local Burmese Buddhist people. Consequent conflicts never end and under a demand of citizenship for all Rohingya people and the autonomous council for all recent intruders from Bangladesh, situation worsened. Communal clashes between Rohingya Muslims and the Rakhaine Buddhists marked many more spots in the culpable calendar. Definitely, the bouts of ethnic violence in the Rakhine region of Myanmar since the middle of this year have once again triggered the attempted exodus of Rohingyas into Bangladesh. But, the Myanmar government continues to take the stand to deny citizenship to the Rohingyas, claiming that their ancestors, originating from areas now part of Bangladesh, unlawfully trespassed into and settled in the Rakhine region. On the other hand the Government of Bangladesh argues that it is an internal problem of Myanmar, and a more apathetic Bangladeshi policy regarding the Rohingyas would simply instigate a governance failure in Myanmar. Within these turmoil, the unrest from both the Buddhist nationalist citizens and the subversive Rohingya non-citizen Muslims, have chanced the Jihadi out cry in an international level. The Islamic lobby in US, UK and India has set up a Rohingya Council to legitimize the claim of Citizenship of illegal Bangla speaking Rohingya Muslims in Arakan-Rakhine region or to rehabilitate the uprooted Rohingya Muslims in India, USA, Canada, UK or in other non-Islamic states. In India, Hyderabad and Delhi are now being populated by these illegal Rohingya Muslims. In very recent Jamiat e Ulema Hind (India) urged Islamic nations to help Rohingyas’ cause. but never requested Arab, Pakistan or Bangladesh to resettle these Rohingya Muslim people in their Islamic land. Interestingly, Bangladesh is not ready to return back any single Rohingya Muslim in Bangladesh land, rather it is hinted that the Rohingya Bengali speaking Muslims are getting arms-ammunitions-funds from Bangladesh based Islamic Jihadi groups to set a Jihadi regime in Rakhine state in Myanmar. However, the Buddhist people and the Buddhist monks are fighting their best to restore and retain a Buddhist-Burmese culture in the Arakan-Rakhine area. 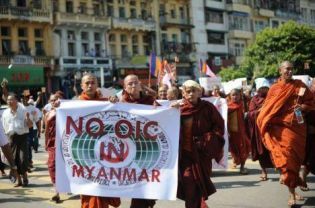 In Yangon, the Buddhist monks marched in roads to thwart Islamic planto make Arakan-Rakhine area as a IMF (Islamic Menace Free) region. Communal violence between Bangla speaking Rohinga Muslims and the Burmese speaking Buddhists are posed as a regular occurrence in Arakan. A state of Emergency has been declared in Rakhine State by the President of Myanmar as on 10-6-2012. But, out of this communal clashes, the Bengali speaking Hindu and Buddhist people in the Arakan-Rakhaine areas are being victimized grossly. These Bangali (Bengali) speaking Hindus and Buddhist are quite different from Rohingya Muslims. Though both of these two different communities speak in a peculiar Bangla dialect akin to “Chittgang Bangla’, they are far different in their cultural and ethical values. While the Rohingya Muslims are subversive and Jihadi, the Bengali speaking Hindus and Buddhist are Nationalist, loyal to Myanmar Constitution and obviously peace-loving. But, out of a great mistake the Rohingyas and Bangali Hindus are being kept in same Refugee camps, where the later Banglai Hindus are being onslaught of Rohingya Muslims, the Bangali Hindu women and girls are being raped or pregnant by Islamist Rohingyas. Report narrates that: Ninety eight Bengali speaking – Non Rohingya – Hindus were sent to refugee camps treating them as Rohingya Muslim, but those 98 Hindu refugees from 18 families were evacuated from Rohingya Muslim camp. 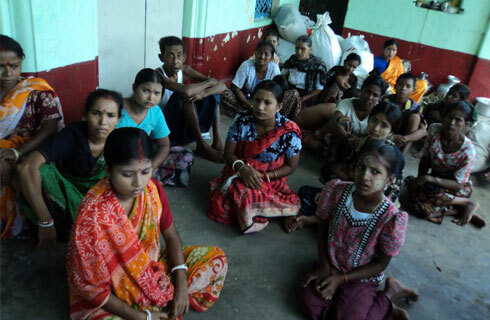 98 people from 18 Hindu families were moved from their current shelter of Thae Chaung and Thak Kay Pron camps to Sittwe city due to increased threats by Bengali Muslim extremists after many reported rapes and attempted rapes and tortures committed by the Bengali Muslims who are majority in the camp. The transfer was carried out by two military trucks and the Hindu refugees are now living in a Hindu temple located on Mongbagree road. 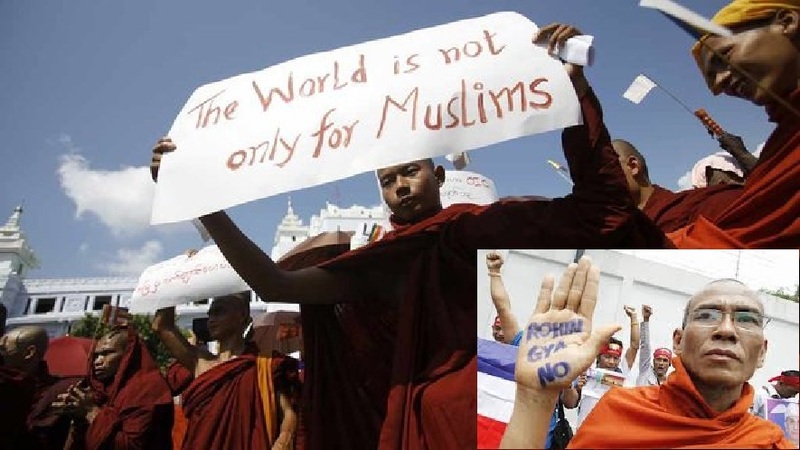 The existence of Hindu people in the Rohingya Muslim camp was first noticed by Ashin Virathu, a prominent monk from Mandalay’s famous Ma-Soe-Yin Buddhist institute. The monk expressed his concerns about the condition and suffering of the Hindu people in the wrong place. He also requested for the relocation of those people to a suitable place in a statement issued on 20th July, 2012. It is reported that Rohingyas (Bengali Muslims) destroyed many Hindu temples during the riot. According to reliable sources, more than 40 Bangali speaking Hindus were beheaded and murdered by the same Bengali speaking RohingyaMuslim terrorists in Sittwe, Buthidaung and Maungdaw townships. However, those Hindu vict ims are not included in the government’s official death tolls of the communal riot. 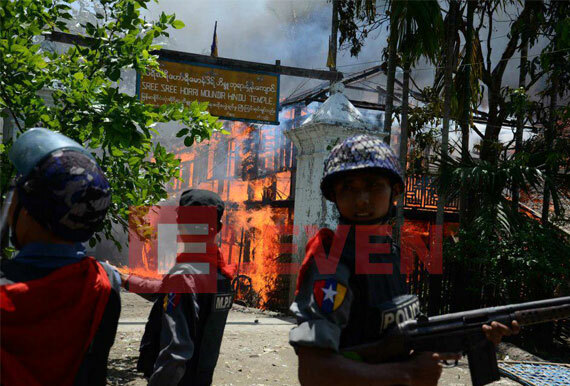 Myanmar police covering in front of a Hindu temple which was burned down by Rohingyas ( the illegal Bangladeshi Muslim immigrants). This is a great misunderstanding by the Buddhist resistance force and the Myanmar State authorities to treat the Bangali speaking Hindus of the Rohingya affected regions as same with the rebellion Muslim Jihadi force. Bangali speaking Hindus in Arakan-Rakhaine areas are not Rohingya Muslims and they must be rescued from the onslaught of Rohingya Muslim rebellions and the strict state proceedings upon Bangali speaking Hindus and Buddhist. The Bengali speaking Hindu people are again being the victims of Rohingya Muslims in both the Rohingya Refugee camps and out of the camps, in the spate of fresh communal violence in recent days. Myanmar Govt. must look into the matter very seriously to stop any torture upon Bangali Hindu people in the Arakan-Rakhaine affected regions. As per Myanmar Govt. statistics, “the main religions of the country are Buddhism (89.2%), Christianity (5.0%), Islam (3.8%), Hinduism (0.5%), Spiritualism (1.2%) and others (0.2%). Religious intolerance or discrimination on grounds of religion is nonexistent in the Union of Myanmar throughout its long history”. But, now the less than 1% Hindus in Myanmar are facing the threat of total extinction. The Myanmar Govt, Revered Aung San Suu Kyi, Revered Ashin Virathu of Ma-Soe-Yin Buddhist institute – Mandalay, the NRI – Human Rights Forums and Indian Govt. must look into the matter seriously, so that No Bangla speaking Hindu – Buddhist people can be victimized by the Rohingya Islamist nor be humiliated by state authority out of any reluctance. RESCUE BENGALI SPEAKING HINDU – BUDDHIST PEOPLE FROM ROHINGYA MUSLIM CAMPS AND SAVE THEM IN JIHADI FIELDS OF ROHINGYAS IN MYANMAR. 1. According to the Wikipedia, there are more than 56,000 Bengali Hindus in Myanmar, the third largest concentration of Bengali Hindus in any country, after India and Bangladesh – http://en.wikipedia.org/wiki/Bengali_Hindus. All the Bengali Hindu organizations of the world must come together to save the Bengali Hindus of Myanmar, who are silently suffering in the hands of the Rohingya Muslims in Rakhine state. 2. Bengali Hindus have started wearing homemade cards around their neck, saying ‘I am Hindu’ – http://www.asianewsnet.net/home/news.php?id=38188. 3. No other Hindu Organisations/Bengali Hindu Forums have raised their voice against this persecution upon Bengali Hindus in Rakhine (Maynmar) State by the Rohingya Muslims, except HINDU EXISTENCE. The self proclaimed ‘Saviour of Bengali Hindus’ Leaders in Kolkata are perhaps busy now in other engagements. It is a matter of great concern. The Muslims in the Indian subcontinent are snatching the Hindu claims everywhere, every sphere. Myanmar is not an exception. Bengali Hindu leaders must convene a press conference at Kolkata to protest the persecution upon the Bengali Hindus by Rohingya Muslims in Rakhaine state. We must be grateful to HINDU EXISTENCE serving as a potential Hindu Site. Please propagate this site as a weapon of Hindus in the field of awareness generation. Its disturbing to note the situation in Myanmar today and the condition of Bengali speaking Hindus there, it is also shocking to know the agony of Bengali speaking population living in Burma where once up on a time Bengali population used to think it is there second home. The local administration should understand this sentimental attachment and should take action against those terrorists. For these uncivilized Rohingya Muslims (unfortunately Bengali speaking) originated from Bangladesh, the entire Bengali Society is ashamed. These miscreant Rohingya Muslims are the main cause of the persecution of Bengali speaking Hindu populace in Rakhine Province of Myanmar. These Rohingya Muslims have under-dignified the status of Bengali Community and caused many ill criticism. We must understand that Bengali Speaking Hindus are not the Rohingya Muslims, and Bengali Hindus must not be in-dignified anyway any more. My Good wishes for Hindu Existence. Don’t hold your breath for any help from the current Indian government. The Indian government cannot protect Hindus in Kashmir. More than 400, 000 Hindus from Kashmir are living in squatting tents in the outskirts of Delhi after being driven out from their ancestral homes by Jihadi Muslims. Thousands of Bodo Hindus have been challenged in their ancestral homes by the same Muslim perpetrators. The current Indian government refuses to arrest thugs from the Congress Party who killed large number of innocent and peaceful Sikhs on the streets of Delhi in 1984. Indians/Hindus from the Caribbean, Fiji, Malaysia, Uganda, etc. did not receiveАав┬аhelp from the Indian government. These Indians/Hindus were/are living under brutal dictatorship. To compound matter the Indian government supported and entertained these dictators. Many Hindus from the PIO diaspora communities consider the current Indian government as “jokers”. This entry was posted on November 10, 2012 by hinduexistence in Attack upon Hindu Temple by Muslims, Attack upon Hindus & Hindu Temples, Attack upon Hindus by Muslims, Buddhists are under Islamic attack, Conspiracy against Hindus, Hindu Buddhist Unity, Hindus under Islamic Aggression, Save Hindu Dharma, Save Hinduism and tagged Bangali speaking Hindus are not Rohingya Muslims, Myanmar, Rohingya Muslims, SAVE BENGALI SPEAKING HINDUS FROM ROHINGYA MUSLIM IN MYANMAR, Save Myanmar Hindus from the onslaught of Rohingya Muslims.